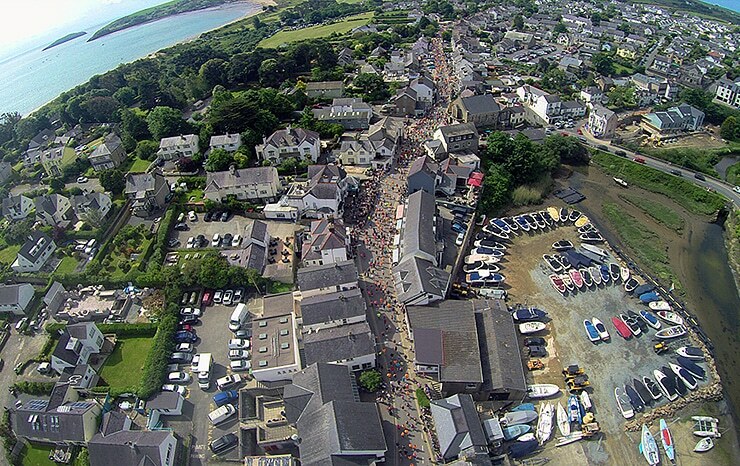 The Abersoch 10K has over 1,000 runners take part & creates the most amazing atmosphere in the village. Taking place on Saturday 1st June the race attracts runners from all over the UK and is supported by thousands of spectators who all get involved in this great day. A well organised event with Bibtag Chip timing technology, clear mile markers, good marshaling, drink stations, over £1,000 prize fund, iconic trophies and just a fantastic atmosphere throughout the day. The Abersoch 10K is firmly established as a favourite of many runners from around the UK. Both elite runners & beginners to the running scene relish the vast array of unique & satisfying elements that the Abersoch 10K has to offer. The start overlooks the harbour, just past Manana restaurant and for the first kilometer the race runs through the high street and channels up Lon Pentre Bach to the Deucoch, then heads left down to the Sarn Bach crossroads. Heading straight over there’s a section of narrow lanes heading towards the far end of the beach. Then a short section of road running round the bay, then the main hill that is a track lasting for 0.3 of a mile (picking the right line up here will make it so much easier for you!). Some undulating roads for 2 miles, looping back round till you head down onto the golf course before joining the far end of the beach. One kilometer along the beach(including some groynes) to the finish just before the middle slip ramp. A big finish on the beach and a great social occasion afterwards.